December is a time for celebrate. 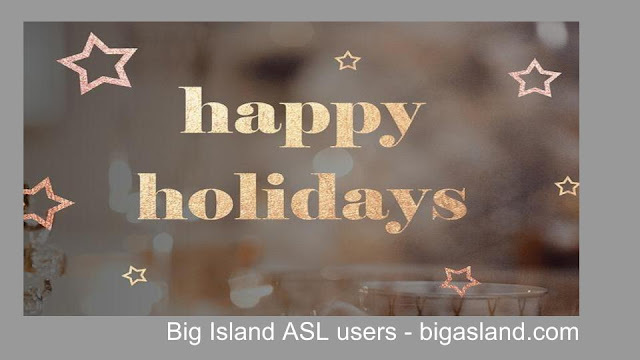 Also, Deaf community on the Big Island celebrated Christmas Party. On December 16, 35 adults and children joined Diamond Head School Alumni 6th Annual Joint Winter Christmas Party at the Mokuola Ballroom 1 of the Hilo Hawaiian Hotel. The Mokuoloa Ballroom 1 has a beautiful lookout to Coconut Island and Hilo Bay. That is not the first time to happen on the Big Island. Two years ago, Diamond Head School celebrated with the Deaf community in Kailua Kona. Laura Roberts, President of Diamond Head School Alumni gives awards to volunteers. Beverly Greenwell and Myles Nishiyama got the certificate of Appreciation. Also, Norman Kai from the Big Island got this certificate. Deaf Santa visited the Big Island For Fourth Time ! Big Island Deaf Club, Angela Nagata (Teacher of the Deaf), Deaf Mental Health Services (Roxsanne Tomita), Dominos Pizza Waimea, Toys for Tots, and Parker Ranch Shopping Center supported a Deaf Santa Christmas at the Parker Ranch Shopping Center in Waimea on December 7 2017. 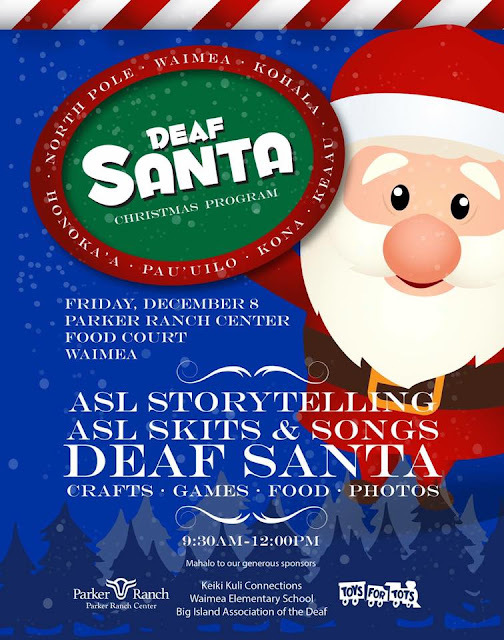 In the Parker Ranch Shopping Center Food Court Room, Deaf students from Waimea- and Keaau Elementary School came with her/his family for a delightful visit and photos with Deaf Santa at Parker Ranch Center. Also, they shared with children with the autism from Kona Classes to greet "Santa!" in American Sign Language. ASL Class also in Kona for the first time in the history ! Required text: Signing Naturally, Units 1-6, etc. 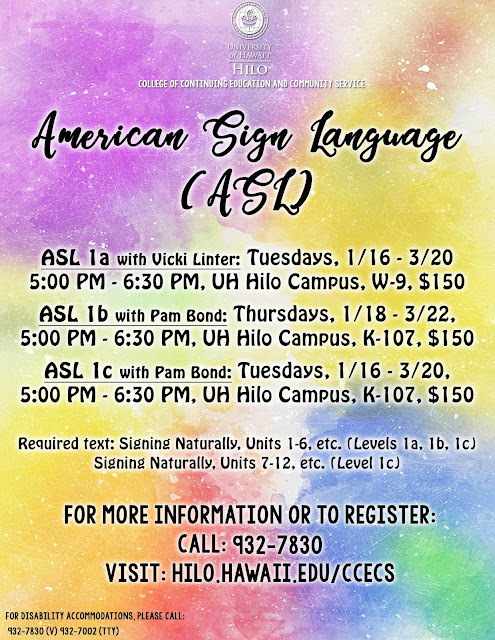 New ASL Class also in the Spring 2018 ! Disabled Job Seekers Left In Limbo By Agency's Cash Crunch: Hawaii's vocational rehabilitation program insists the problem is temporary, but some clients fear they'll lose their support. Tired of rain ? 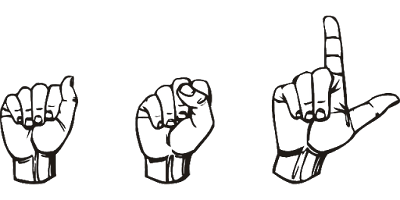 Please come at the Deaf Chat Coffee on December 9 ! Hearing people also welcome! Take your family and friends to this unique event, please! Miss this chat? Don’t worried! Deaf Chat Coffee will find on every 2nd Saturday of each month from 6 pm to 9 pm at Starbucks.